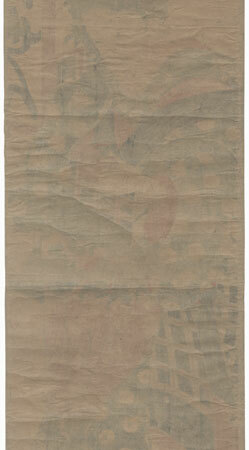 Comments - Beautiful kakemono or vertical diptych of a young waitress holding a small oil lamp. She eyes the flame carefully, shielding it from drafts with her kimono sleeve. She wears a blue kimono patterned with white flowers, a red apron with a maple leaf design tied around her waist and a towel draped over one arm. Her hair is pulled back into a sleek bun, adorned with a small comb and a few decorative hairpins. 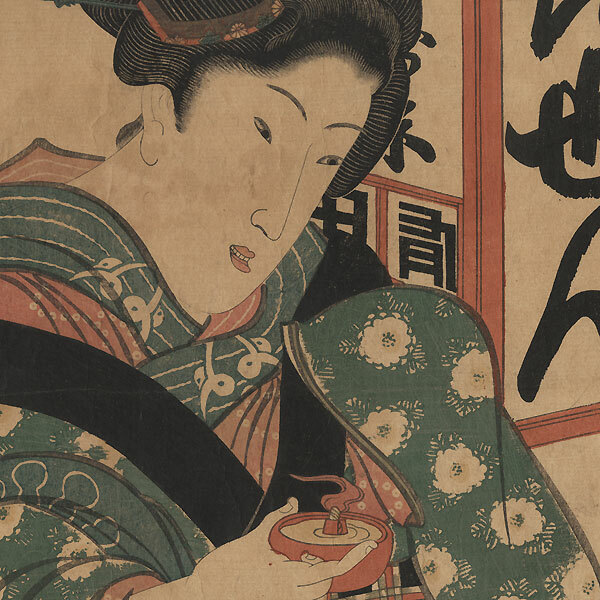 A blue and white porcelain cup sits on a bench behind her, and a lantern painted with kanji characters hangs at upper right. A beautiful composition with curving lines leading the eye through the image, with wonderful detail. A lovely example of Eizan's beauty prints. Image Size - 26" x 8 7/8"
Condition - This print with good detail as shown. Two attached panels, backed with paper. Creasing, slight toning and soiling, a few spots. Please note: due to the size, this print may be shipped rolled. Please see photos for details.